Canada lost a national icon this week, with the death of Inuit artist Kenojuak Ashevak on January 7. Many Canadians are familiar with her image “The Enchanted Owl,” which appeared on a Canada Post stamp in 1970, but few know the name of the artist – a pioneer of Inuit art whose drawings, prints and sculptures are in collections world-wide. Born in an igloo in 1927, Kenojuak’s early life was that of the traditional nomadic Inuit. After her father died when she was six, she went with her mother, brother and sister to live with her grandmother, who taught her traditional crafts such as embroidery and how to prepare sealskins for trade with the Hudson’s Bay Company. Eventually she settled in Cape Dorset, a community at the southern tip of Baffin Island, Nunavut. In the early 1950s, art promoter James Houston travelled to Cape Dorset where he spotted a sealskin bag Kenojuak had embroidered with a picture of a rabbit eating seaweed. He gave her paper and a pencil and asked her to draw it, and that drawing became her first print. At that time the idea of becoming an artist did not exist in Kenojuak’s world, yet her early drawings showed strength and confidence. The Enchanted Owl, 1960. Stonecut on paper. Image courtesy of Dorset Fine Arts, used with permission. 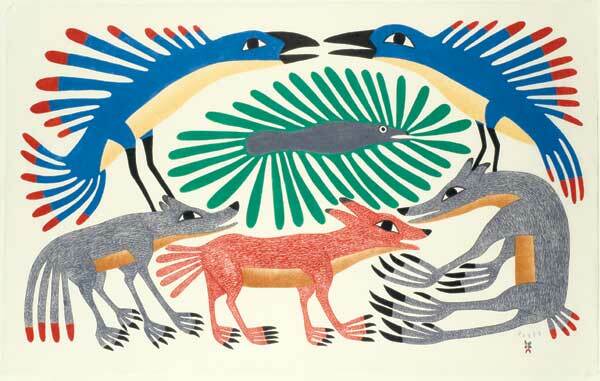 Houston encouraged the residents of Cape Dorset to reproduce drawings as stonecut prints. In her twenties Kenojuak began selling her art and gaining recognition, especially following the release of the National Film Board short film “Kenojuak” which was nominated for a Documentary Short Film Academy Award in 1963. In 1970 she took part in the World’s Fair in Osaka, earning her international attention. As her recognition grew, so did that of Cape Dorset, whose successful printmaking workshop continues to this day. Although most artists were men, Kenojuak became a role model to many Inuit artists – but she remained humble and thankful for the gift of her talent. There is no word for art. We say it is to transfer something from the real to the unreal. I am an owl, and I am a happy owl. I like to make people happy and everything happy. Kenojuak’s work was innovative. Although it would later become more sophisticated in detail, she remained true to the striking style and flowing, natural beauty she first produced as a young woman. "Six Part Harmony," 2011. Stonecut & stencil on paper. Image courtesy of Dorset Fine Arts, used with permission. Kenojuak played a large role in bringing international recognition to Cape Dorset and its artists. Drawing upon thousands of years of Inuit tradition of drawing and carving interpretations of the natural and spiritual world, her journey took her from the humblest of beginnings to, ultimately, one of the highest levels of achievement – Companion of the Order of Canada (in 1982). She was also awarded the Governor General’s Award for Visual Arts (2008) and the Order of Nunavut (2012), and received honorary doctorates from the University of Toronto and Queen’s University. Her work has appeared on postage stamps and coins, and is in collections worldwide. 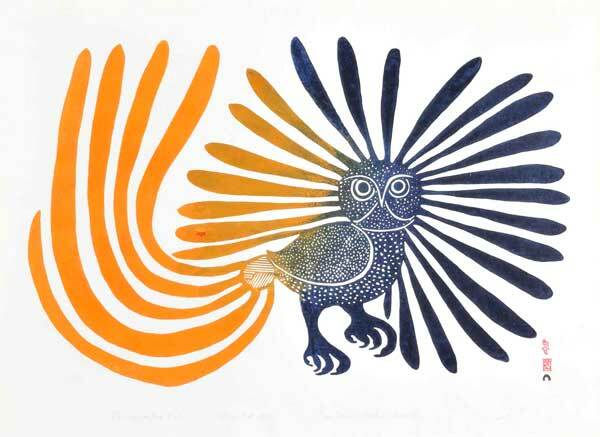 There are 50 works by Kenojuak at the National Gallery of Canada, including the original drawing for “The Enchanted Owl.” A print of her iconic “The Enchanted Owl” recently sold at auction for $58,000. Kenojuak Ashevak died in Cape Dorset at the age of 85. 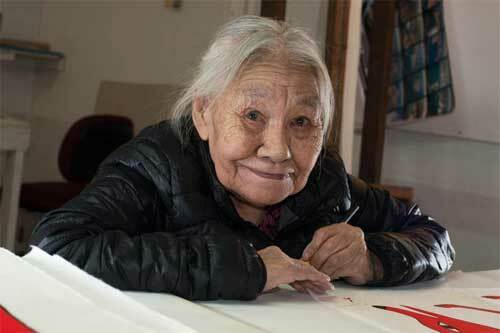 Her contribution is almost immeasurable – she was a treasure, perhaps the last living link to the origins of Inuit printmaking, and an inspiration to generations of artists. Thank you for this, Kate. Her work is a treasure and so was her life.